The Life and Times of All the Men and Women of the Bible Bringing together two books in one convenient volume, All the Men/All the Women of the Bible is a portrait gallery and reference library of over 3,400 named biblical characters. Taken from the time-honored "All" series by Dr. Herbert Lockyer, this book mines the wealth of Scripture to give you characters you can learn from, teachings you can apply, and promises you can stand on. All the Men This monumental book puts comprehensive information on the men of the Bible at your fingertips, including a list of major characters. Besides named individuals, it also classifies the thousands upon thousands of unnamed men. It includes a guide to the often complex pronunciations of biblical names. And it explores the attributes of Jesus, God's model for biblical manhood. All the Women From Abi to Zipporah, discover how the lives and character of different biblical women, named and unnamed, mirror the situations of women today. 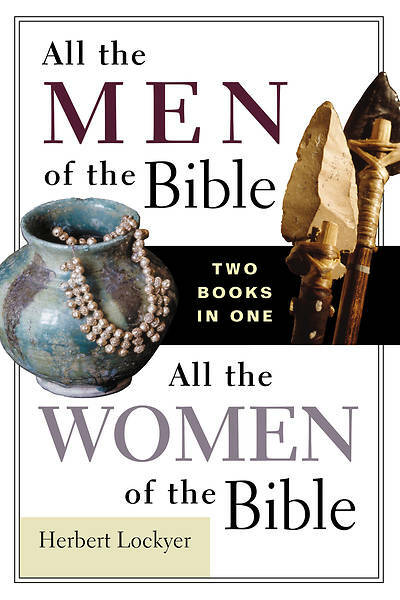 More than 400 profiles offer fascinating insights into the Bible's multidimensional women. Wives, mothers, single women, prophetesses, queens, leaders, villainesses, and heroines--all are portrayed in rich, thought-provoking detail.